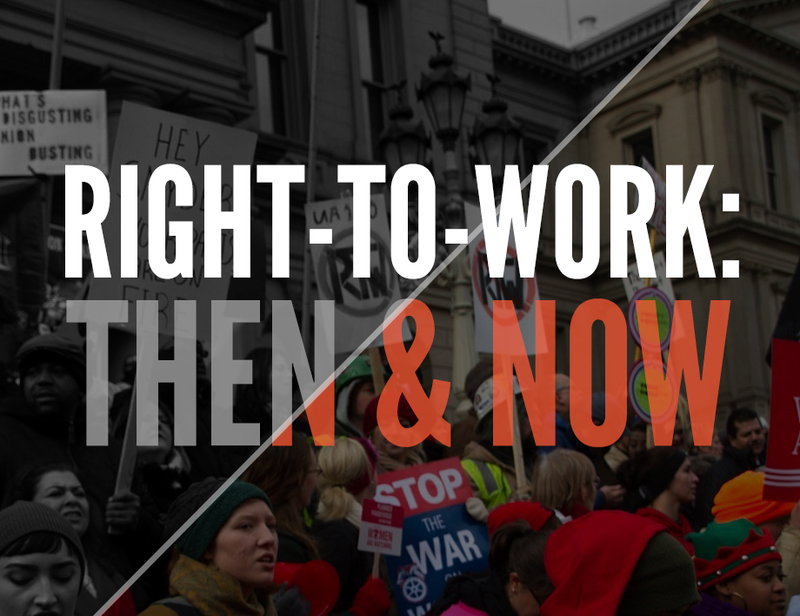 This is first in a series of stories looking at the impact the 2012 right-to-work law had on unions in the state of Michigan. The article ran against the common sentiment of the pro-union lobby, which argues the law that gives employees the freedom to not associate with a union while still keeping their jobs was designed to undercut and weaken organized labor. But data from a website that tracks union membership across the country supports the idea that right-to-work doesn’t have to be the death knell for unions. In Michigan, private sector union membership has actually grown by 7 percent since 2012, when Michigan’s right-to-work law was passed. In 2012, there were 375,163 private sector union members. That grew to 401,882 in 2015. The data comes from Unionstats.com, which draws on the U.S. Bureau of Labor Statistics. There are many theories to explain why private sector union membership has grown. They range from a growing workforce to unions becoming more proactive in recruiting members now that workers have a choice in whether to join. There were 621,952 union members in Michigan in 2015, or 15.2 percent of all people employed. The trend for union membership here has been downward, long before right-to-work became law. In 1983, there were 1 million union members, which equated to 30.4 percent of all people employed. Grand Valley State University economist Brian Long gives a few reasons why private sector union membership could be growing in Michigan since 2012. Michigan has experienced a large growth in employment, to start with. The state’s unemployment rate was at 9 percent when the law was passed. In the last five months of 2015, the rate was 5.1 percent. Auto manufacturing jobs saw a big increase during that time, leading to more employees eligible to join a union. There were 529,000 manufacturing jobs in Michigan in 2012. Employment in that sector jumped to 587,000 by 2015, according to the U.S. Bureau of Labor Statistics. Long says unions that provide a benefit to members have done well under right-to-work. The Michigan Education Association is one union that has seen a drop in membership since right-to-work passed. The public sector union has had its local unions bully employees who chose right-to-work and has reported its members late on paying dues to collection agencies. The MEA had 117,626 active members in 2012 but only 94,559 in 2015. Total public sector union membership in Michigan has dropped from 253,636 people in 2012 to 220,070 in 2015. "Maybe when right-to-work legislation is passed, it makes unions realize that they must make themselves appealing to potential customers and become more responsive to their current members' needs,” said Larry Sand, a former teacher who started the California Teachers Empowerment Network to educate people about unions. Sand added that in non-right-to-work states, “unions don't have to be concerned with such niceties." Brian Rothenberg, the UAW senior communications advisor, didn't return an email seeking comment.